FROM HILDEGARD OF BINGEN TO HIP-HOP – SIR HENRY WOULD BE PROUD! Fifty years after Apollo 11 landed on the Moon, the Proms ponders how composers across the centuries have imagined and created the sound of space. In the hope of inspiring young minds, three major new works in concerts for families reflect the changing world around us and highlight the topical debate about the future of our planet. From afropop to jazz, hip-hop to pizzica, and electronica to meditative listening, this year’s Proms is a truly eclectic festival. Up to 1,400 Promming tickets will be available for £6 for every Prom and 100,000 tickets will be available for £15 and under. As ever, BBC Radio 3 will broadcast every single note, BBC Sounds will give audiences ready access to the Proms, and there will be 25 Proms on TV this season. Marking the 150th anniversary of founder-conductor Sir Henry Wood’s birth, the 2019 BBC Proms presents one of its most diverse programmes yet. Remaining faithful to Wood’s mission to ‘bring the best classical music to the widest possible audience’, the Proms offers a wealth of genres and styles in a range of contexts. Whether it’s Murray Perahia performing Beethoven’s Fourth Piano Concerto with the Vienna Philharmonic under Bernard Haitink or a Prom dedicated to the genius of Nina Simone with Ledisi and Jules Buckley, the quality and range of what’s on offer showcases the very best of music. Henry Wood was arguably one of the world’s first audience developers, committed to increasing access to the arts. The Proms’ proudest tradition is that of daily Promming(standing) tickets – a Henry Wood innovation to reach the broadest audience possible. This marks the fourth year that up to 1,400 Promming tickets will be available for £6 for every Prom. And, to further mark the Promming tradition, a special Proms at … Battersea Arts Centre will see all tickets for the event priced at £6. Over at the Royal Albert Hall,100,000 tickets will be available for £15 and under. As an educationalist, conductor and champion of young people, Henry Wood provided countless opportunities for aspiring young artists to get involved in classical music; it’s a proud tradition that the Proms continues to reflect today. This season celebrates the 20th anniversary of BBC Radio 3’s New Generation Artists scheme, featuring 12 of its alumni. Elsewhere, other notable debuts take to the concert platform, including Leeds International Piano Competition winner Eric Lu and Lithuanian soprano Asmik Grigorian. Once again, BBC Proms Learning offers a diverse range of creative opportunities beyond the concert platform. Initiatives such as BBC Proms Inspire for composers, Proms Youth Choir Academy and the Proms Youth Ensemble will reach hundreds of young people this year. At the church where he was buried, Proms at … Holy Sepulchre London will continue the celebration of Wood with a special concert from the BBC Singers under Chief Conductor Sofi Jeannin. The Proms at … Cadogan Hall series is underpinned by a historical journey through classical music, celebrating some of the most notable women composers of the past, from Hildegard of Bingen via Barbara Strozzi and Clara Schumann – both of whom have anniversaries this year – to the present day with a BBC commission from Freya Waley-Cohen. Offering a fresh take on the history of classical music through the eyes of women, each concert in this series will contain at least one work by a woman composer of the time. From afropop to jazz, East Coast hip-hop to South Italian pizzica, and electronica to meditative listening, this will be a truly eclectic celebration of the diversification of music. A Prom devoted to the music of singer, pianist, and social activist Nina Simone explores her background and enduring influence; and an exhilarating evening of dance, song and spectacle, Duke Ellington’s Sacred Music is presented in a Late Night Prom. From breakdancing to MC-ing and DJ-ing to graffiti art, The Breaks will honour the global phenomenon of hip-hop and, in particular, breakbeat culture. The Late-Night Mixtape Prom will bring together an eclectic range of classical and contemporary sounds. Bringing the popular concept of a music-mix into a ‘live’ context, this Prom will feed into the experiential model that drives so much of music consumption today, where immersion and discovery is key. Fifty years after Apollo 11 landed on the Moon, the Proms ponders how composers across the centuries have imagined and created the sound of space. The first work heard at the 2019 BBC Proms will be a BBC commission and world premiere from Zosha Di Castri, Long Is the Journey, Short Is the Memory, inspired by this monumental event. On the very day that marks the 50th anniversary of the Moon Landings, Holst’s The Planets is complemented by John Adams’s ever-popular Short Ride in a Fast Machine. The CBeebies Prom, which will be broadcast on the channel, will offer families the chance to travel through time and space with some famous faces including Mr Tumble and Chris Jarvis, hosted by YolanDa Brown, featuring the Chineke! Orchestra under Kwamé Ryan. Other highlights in this strand include: the UK premiere of Anna Thorvalsdottir’s Metacosmos – a musical metaphor for falling into a black hole – conveniently timed just three months after astronomers captured the first ever image of a black hole, as revealed last week. Public Service Broadcasting orchestrate their ground-breaking 2015 concept album The Race for Space, a mix of music and broadcast recordings portraying the tale of the US/Russian ‘Space Race’. In a Proms first, the Sci-Fi Film Music Prom features scores from cult space and sci-fi films, including Steve Price’s Gravity and Mica Levi’s Under the Skin, presented by the London Contemporary Orchestra under Robert Ames. A number of concerts targeted specifically at families will use compelling storytelling to highlight topical debate. An exploration into our roles as guardians of our planet complements a study of the solar system. Alongside famous works inspired by the natural world, three new works highlight how music can be relevant to the times in which we live and, in this case, support the conversation around sustainability and protection of the planet. The Lost Words Prom, based on Robert McFarlane and Jackie Morris’s popular book about the disappearing language of nature, will feature spoken word and beat-boxing. John Luther Adams’s In the Name of the Earth – a huge, landscape-inspired choral work – will feature four community choirs with over 600 singers. Finally, a brand-new work by Hans Zimmer, Earth will receive its world premiere this year. The Proms has always been at the forefront of cultural and musical innovation, bringing the best new works to audiences. As a global visionary, Sir Henry Wood gave the world and British premieres of hundreds of works at the Proms including Stravinsky’s The Firebird, Sibelius’s Violin Concerto and Schoenberg’s Five Pieces for Orchestra. This year, we celebrate 33 of the pieces that Wood introduced to UK audiences, alongside 33 new works for 2019. New music highlights include Radiohead’s Jonny Greenwood curating a Late Night Prom culminating in the world premiere of his Horror vacui. The piece simulates electronic sound using 68 string instruments played acoustically. Proms at … Battersea Arts Centre will showcase boundary-crossing and provocative composer-performers, featuring experiments at the cutting edge of music and technology with Jennifer Walshe, Crewsdon & Cevanne and Oliver Coates. Elsewhere, Martyn Brabbins presents a 21st-century companion to Elgar’s ‘Enigma’ Variations 120 years on. Based on a new anonymously written theme, this work features variations by 14 living composers including Sally Beamish, Sir Harrison Birtwistle, Dai Fujikura and Judith Weir. Henry Wood’s Proms seasons were famous for nights dedicated to one composer. In celebration of that concept, the final week of the 2019 season replicates Wood’s original programming: a Monday evening of Wagner, a Wednesday evening of Bach and a Friday evening of Beethoven. More than a century ago, these concerts were perhaps the first example of ‘box-set binging’. 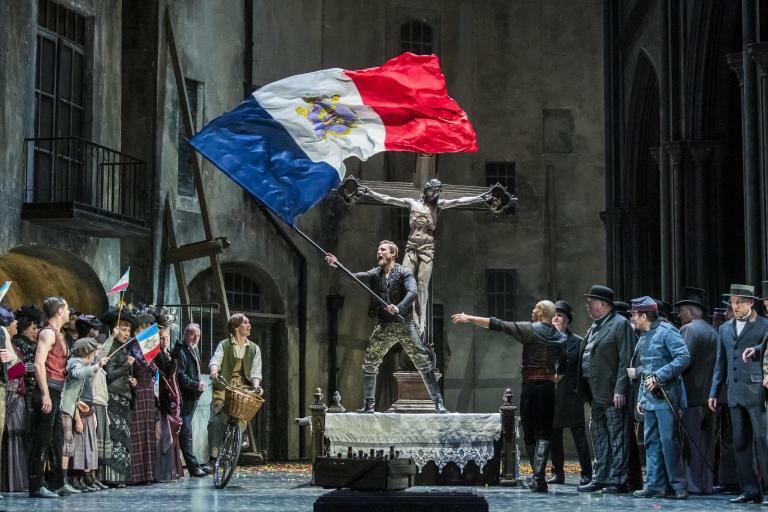 As part of a celebration of Berlioz at 150, Sir John Eliot Gardiner and the Orchestre Révolutionnaire et Romantique present the rarely performed opera Benvenuto Cellini and Nicholas Collon and Aurora Orchestra bring a dramatic treatment of Symphonie fantastique with actor Mathew Baynton. Other composer anniversaries include: Louis Andriessen at 80, Peter Eötvös at 75 and Sir James MacMillan at 60. A special focus on Weinberg, who would have been 100, includes his String Quartet No.7 and the London premieres of his Cello Concerto and Symphony No.3. Once again, BBC Radio 3 enables the festival to reach millions each year by broadcasting every single note and, new for this year, audiences now have ready access to the Proms through the BBC Sounds app allowing them to engage with the festival anytime, anywhere. There are 25 Proms on TV for audiences to enjoy and the Proms magazine show returns to BBC Two on Saturday nights throughout the festival. Across more than 90 concerts over eight weeks, the Proms draws the world’s greatest classical musicians to London. From Martha Argerich and Daniel Barenboim to Joyce DiDonato and Sir Antonio Pappano, the festival will amplify the work of today’s most acclaimed artists. Mezzo-soprano Jamie Barton will feature at the world-famous Last Night of the Proms, Sheku Kanneh-Mason will perform Elgar’s Cello Concerto, and Nicola Benedetti and Pekka Kuusisto will contribute to a season-wide survey of well-loved and lesser-known violin concertos. Of particular note: in the bicentenary year of Queen Victoria’s birth, Stephen Hough performs Mendelssohn’s Piano Concerto No.1 on her very own piano. Loaned from the Royal Collection Trust by Her Majesty The Queen, this will be the first time the Erard piano will be played outside Buckingham Palace. The programme also includes songs written by Prince Albert. Once again, the BBC Orchestras and Choirs form the backbone of the BBC Proms, appearing in over a third of the concerts this summer. Newly appointed Chief Conductor Designate of the BBC Philharmonic Omer Meir Wellber and Principal Guest Conductor of the BBC Symphony Orchestra Dalia Stasevska both make their Proms debuts this summer, and Karina Canellakis becomes the first woman to conduct the First Night of the Proms. Alongside the BBC Orchestras there is a wealth of international orchestras, from the Vienna Philharmonic with Bernard Haitink & Andrés Orozco-Estrada and the Bavarian Radio Symphony Orchestra with Mariss Jansons to the Shanghai Symphony Orchestra which makes its Proms debut in its 140th year under Long Yu. Since it was first introduced in 2017, the Relaxed Prom has become one of the most popular events in the Proms calendar. This year it returns to offer a relaxed performance around core classical repertoire of Rachmaninov and Tchaikovsky. The Prom will be fully accessible to family members of all ages, children and adults with autism, sensory and communication impairments and learning disabilities, as well as individuals who are Deaf or hearing impaired, blind and partially sighted or living with dementia. Henry Wood’s vision brought to life; this event is truly open to all. For further information, please visit the BBC Proms website (click here) which will be available from 7.00am on Wednesday 17 April.